We at kennel Dancewood are Mona and Allan. We live in Bruvoll Nord-Odal. 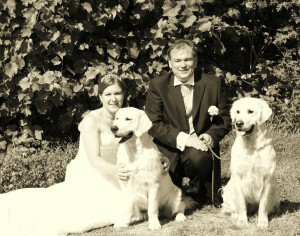 Our first Golden Retriever we got in 2007 who was N S UCH Come Fly With Me Av Vervik. Mona wanted a cat and I wanted a Golden, Mona was not keen to have a dog but soon she felt in love with the breed. Now the pack has growth to 9 Goldens, and to be honest i dont think it will stop there. All we do is for the dogs, they are our lives and love ones. They all live in our house and sleep in our bed. They are full family members. Our main hobby with the dogs are showing them, but we also like to work with them. 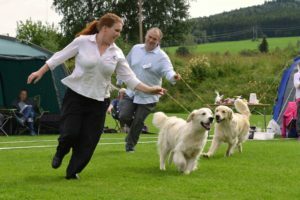 We compete in Field trials and training obedience and Tracking. Our Goals in Breeding are to breed Sound, Lovley and working goldens who can be a part of some ones family.